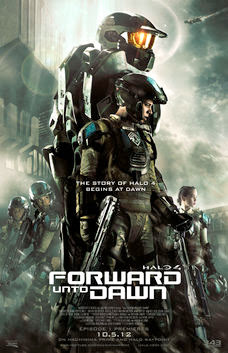 Halo 4: Forward Unto Dawn is a live-action webseries that debuted on October 5, 2012 and had a new episode each Friday until the release of Halo 4 on November 6, 2012, ending with the fifth episode. The webseries was announced by Variety magazine on April 30, 2012 and represents the largest monetary investment Microsoft has ever put behind a live-action Halo project. Next to no details were revealed by Microsoft but the plot, cast and director details were announced at the San Diego Comic-Con. Aside from marketing Halo 4, the goal of the webseries is to introduce the franchise to people unfamiliar with the games. 343 Industries franchise business management director, Matt McCloskey, said to Variety: "make Halo accessible for people who haven't played the games. We wanted to do something unique from a narrative standpoint that's big in scale.